Math lab is our designated time to work on skills at our individual levels. Using a combination of NWEA Test scores, Math Benchmarks and Unit assessments groups are designed. Students are paired and grouped with student who are working at the same levels as themselves. While students work in pairs or with their groups, I am able to meet with small groups to review, reteach or introduce new skills. We recently begin to track our progress using trackers. 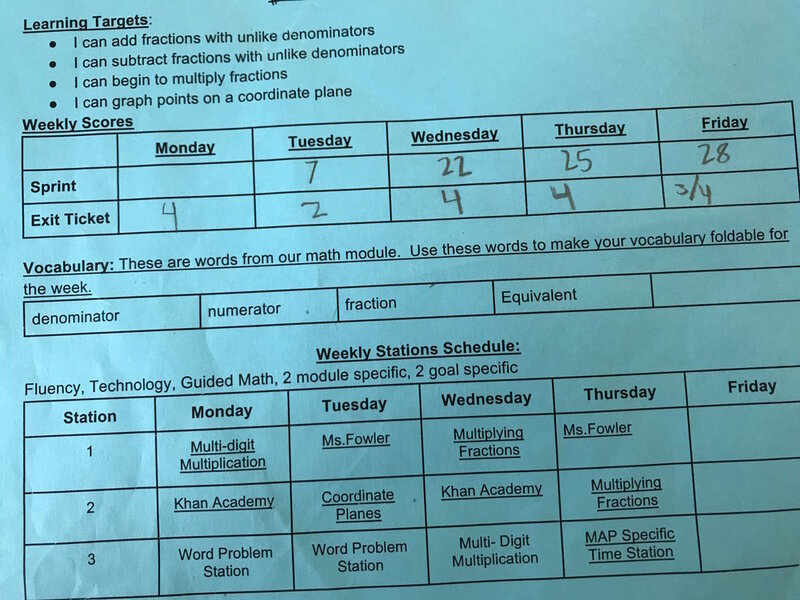 Students receive weekly trackers that include their objectives for the week, a schedule of their centers, an end of the week exit ticket and a reflection. Students use this tracker daily to record, compare and reflect on their progress throughout the week. This tracking system increases my ability to identify the exact needs of the students. It gives me immediate insight about how objectives should be adjusted for the following week.